Aargh. . . my list of advice that annoys me. But I haven’t got any prints in my closet. I’m a patchworker and I have a huge stash of print fabrics. But they are nearly all one-colour prints. Patchwork advice also often tells you to start your colour planning from a multi-colour print. But it’s not something I like to do. But if I could buy a fitted RTW jacket that didn’t make me look like a freak I wouldn’t need to be doing this. And with my high round back and short waist, using RTW neckline and waistline as reference points for length measurements is a very bad idea. Well, I suppose at least that’s a good clue that someone who says this is unlikely to give the sort of fitting advice that I need. It’s difficult to understand how people who say this become style advisors, as they obviously don’t really look at people, and aren’t interested in people as individuals. Well at least it’s a good cue not to take their advice. Why are so many people who make sewing videos so badly dressed. . . Partly it’s the universal black, which is truly flattering on only a minority of people, and even worse in harsh lighting. Very few TV presenters wear it. I know of 3 fitting videos now where the person giving fitting advice is wearing badly fitting clothes herself. And the wrong styles for their body shape. I won’t say more or you might recognise who I was being unkind about ! But there are several people who give marvellous sewing advice but I wouldn’t turn to them for colour or styling guidance. Of course it isn’t true about all videos, but a surprisingly large proportion. I’m happy to promote independent pattern designers. But some of them give such poor information about their products, they don’t deserve to succeed. As an example : I recently looked for a pattern with a shirt-style sleeve placket. Some of the companies have photos so small you can’t even tell if the style has a cuff (and I’m looking on a desk-top, not a small screen). Or the garment is in a strongly patterned print and there’s no line diagram, so again you can’t clearly see the style. Or there’s no back view, so you can’t tell if a cuff is open or closed. Or there is a line diagram with a back view but it’s so tiny or of such poor quality that you can’t see the type of placket opening. I’m not going to choose a pattern if I can’t tell what its style elements are. Also the information about size can be very limited. Small to Large – what does that mean ? (Extra Large for the Japanese has 38 inch hip. . .) Sizes 4 – 24 : well, are those Big4 pattern sizes or US RTW sizes. Not very helpful. It’s sad, but if pattern designers don’t take the trouble to tell us about their products, they can’t expect us to buy them. Why oh why those daunting lists in beginners’ books, of 100s of tools you must have before you ever begin. It’s a wonder anyone ever gets past that stage. I’ve been sewing for over 60 years and I still haven’t got all of them. You can improvise many tools. Though beware cheap thread and pins. Use new sewing machine needles. And a quality fine tipped seam ripper really does help with near disasters ! LDT2011 at Pattern Review has devised an entertaining sewer’s version of the ‘Keep Calm’ poster. It’s surprising how many books for beginners are much too difficult. And few books for beginners are aware that people have different learning styles. Some like to watch, some like to see, some like to read, some like to share in a class, some need to do it themselves. Some like to be fully guided, some want to find out for themselves. Some like to take tiny fool-proof steps. Some like to jump in the middle and merrily make mistakes. Brief written instructions with no pictures really don’t meet many learner needs. And how many beginners books have not been properly checked or tested. They contain small errors or gaps so the inexperienced don’t know what to do for the best. Thorough testing of what you think is the final product, on real beginners not sewing friends, is essential. I think it’s irresponsible to claim a book is for beginners without doing this. Learning to sew is quite difficult enough – many new skills needed to make even the simplest item. Understanding patterns and fabrics, fit, cutting, marking, sewing, pressing – it’s amazing we ever get confident about it all. In fact the only two sewing books that have got me in a real rage have been books for beginners. It’s sad to give beginners a confusing or even a bad experience. I’m a trusting soul. When people say their pattern making instructions tell you how to draft a successful personal pattern for your body, I used to believe them. But I’ve learned a lot in the past few years. Including that no pattern drafting system (or the software based on them) can allow for all possible body shape combinations. And if they try they can get horribly complicated. Of course people are enthusiastic about the fitting schemes they’ve devised. But please do admit there are some people it doesn’t work for, instead of claiming it works for everyone. I hate to think of all the grief I’ve spent on picking myself up off the floor when yet another fitting method doesn’t work for me and I’ve taken it for granted it’s me that’s done something wrong. . . Sorry about the bad temper ! My first post on wardrobe pattern books talked about books with casual styles. The books in this post mainly have patterns for dresses in fitted shapes. Some are in frilly-girly or modern vintage style. None include pants. A couple have jackets or coats. Most of these pattern books emphasise pattern altering rather than wardrobe building. All have a pack of full sized patterns, usually conventional tissue. by Sarai Mitnick of Colette Patterns. 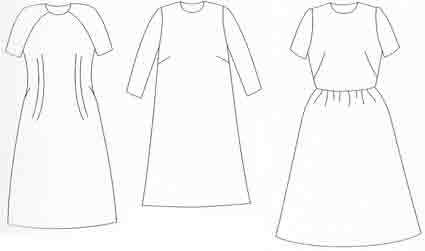 Patterns for several fitted-waist dresses, top and skirt. No jacket or pants. Look like warm weather styles to me 😀 Nothing with long sleeves among her main top and dress patterns either, and only a couple with high necks. She’s in Portland, Oregon – hmm. Obviously she doesn’t feel the cold, she wears these styles even in winter. No jacket and only one coat in her main patterns (here’s a detailed coat sew-along by Gertie). There is a pants pattern, if you’d like to add them. Don’t know about sizing in the book, but her conventional patterns go up to 46 inch bust, 48 inch hip (BMV size 24). I haven’t seen this book but it gets excellent reviews, including for the wardrobe advice and the sewing instructions. Some fit advice. Website also has sewing techniques, fitting and pattern altering advice. – raglan ‘sheath’ with front darts. Despite the name and the darts, there’s only a little waist definition, this isn’t closely fitted. Some styles with zip. – loose shift dress with set-in sleeves. 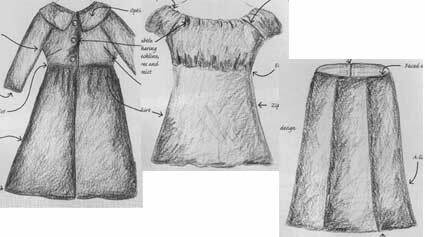 – dress with fitted bodice (french darts), waistline seam and gathered skirt. All styles with zip. Instructions for at least 8 versions of each pattern, plus many more suggestions. You’re expected to draft pattern pieces like collar, cuffs, pockets, facings, from instructions. Sized up to 41 inch/ 104 cm bust, 44 inch/ 112 cm hip (BMV size 20). These are casual/ boho/ edgy dresses, not fitted and frilly girly or vintage glamour. If you like Colette patterns this may not be for you. Or you may prefer this if you avoid closely fitted styles. A little about body shape and fit. Instructions not for beginner sewers. Some reviewers say they had problems with fit or shape. So do make a trial version. Combine with her other books to get a wardrobe, see my previous post. by Kay Whitt of Serendipity Studio patterns, who also designs for McCall’s. 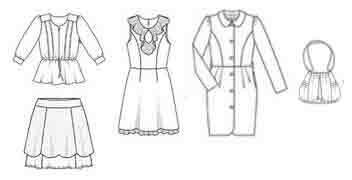 Patterns for skirt, short-sleeved peasant style top-dress, jacket-coat. Raglan sleeves and empire waists. Up to 44 inch bust, 46 inch hip (BMV size 22). Half a dozen variations described in detail for each pattern, plus other suggestions. Some guidance for sewing beginners. She tells you how to make a muslin to check fit, but not how to adjust it. Many hand drawn diagrams in the instructions. No discussion of wardrobe co-ordinates. Kay Whitt loves combining many prints, which is very ‘current’. by Nora Abousteit and Alison Kelly. Patterns for fitted styles of blouse, skirt, dress, lined coat, bag. Shorten coat for a jacket. Sized up to 41 inch bust, 43-1/2 inch hip (BMV size 20). Printed book with full-size traceable patterns overlapped like the patterns in Burda magazine (no seam allowances). Or e-book with download patterns. Tell you how to make a muslin, but only a couple of sentences on adjusting it to fit. Said to be aimed at beginners (several reviewers say it’s not for intermediate or advanced sewers). Personally I wouldn’t recommend this to a beginner, even the most adventurous. Silk charmeuse and lace for a first ever project – what a recipe for misery and disaster. Only 3 of the 15 projects have the lowest skill level rating. And all those require pattern alterations and are not easy easy. The old Burda Level 1-2-3 patterns are all easier than these. Many construction steps briefly explained with no illustrations. I’m disappointed in this as a book for beginners – I was expecting something more like an update of the old Burda beginners books (not in English), which are more realistic about what a beginner can do and have many photos of technique. If you are a complete beginner and like to be creative, build your confidence with something like Sewing Machine Basics or DIY Couture or one of the “Sew What ?” books, before trying this. The big emphasis is on making your own versions. Three guided projects for each pattern. Even more possibilities if you swap tops and bottoms around those waist seams. As a source of inspiration for variations the book is good. My guess is the book was only tested on an ‘inner circle’ of Burda Style site users, who are already happy pattern alterers and devise-your-own-method sewers. These are attractive styles – but only if you already know what you’re doing, or don’t mind many puzzles and disappointments on your way to success. Gertie’s New Book for Better Sewing by Gretchen Hirsch has patterns for 2 blouses, 2 skirts, 4 dresses, jacket and coat-dress. Photos of styles included, in this helpful review from Couture Academic. BurdaStyle Vintage Modern by Nora Abousteit and Jamie Lau. Review from Frabjous Couture has pictures of 3 dresses, shirt and pants included, and an example of pattern altering. If you love dresses, here are some more pattern books. I haven’t seen these myself, and know no more than is available at Amazon. Some of these books focus on fitted styles, some have loose dartless ones. They get mixed reviews, and some patterns are only in small sizes. Did you make any sewing, style, or wardrobe resolutions for the coming year ? What are you hoping to achieve with your resolutions ? What would be the happiest use of your relaxation time ? How would you like to feel in your clothes ? Oh those long lists of sewing resolutions. . .
Plan if you love to follow plans. Free-wheel if you love to free-wheel. It’s one of the big personality differences. Many of the people who like to tell other people how to lead their lives are in the planner group ! Or on the other hand there are all the people who militantly tell you to “let it all hang out”, whether you want to or not. . .
Go with what’s right for you. Sewing’s supposed to be a hobby not a guilt-inducer. There’s a good Stitchers Guild thread on not beating yourself up about sewing. I’m not happy with show-and-tell of my own sewing. Odd I know as I merrily express strong opinions on everything else. . . But there we are. And many people blog about their sewing and styling adventures in interesting ways. So you’re not missing anything from me. What general progress have I made ? Big colour changes. Based on hair, eyes, skin colours – a colour approach which works better for me than others I’ve tried. I now have a group of clothes with caramel/ honey/ muted mid brown as the neutrals. Which I’m very pleased with. Also realised I had mainly dark tops and light bottoms – oh dear – exactly the wrong way round for those of us who are large hipped. . . This year I happened to get Judith Rasband’s ‘Wardrobe Strategies for Women’ at about the same time Nancy Nix-Rice posted her wardrobe plan. (Ignore the terrible Rasband cover photo. The book is full of interesting ideas, and it’s fun to imagine updated versions of the inner style photos.) So I’ve been doing a lot of thinking about my needs. I’m pretty clear now about my best wardrobe plan. And have made good progress with my fitting difficulties. And I know more about how and what I like to learn and sew. I’m also more clear about my personal clothing style. I don’t often find helpful phrases for me, but “artisan chic” comes close. If you’re looking for style words, YouLookFab has a current post on defining your style persona. The comments are full of useful adjectives. Surprising how many people want both ‘boho’ and ‘classic’. Which an extreme classic thinks is impossible. Another sign that casual styles are much wider and richer than they used to be. YLF also has a good post on finding your style from your favourite outfits. This year I have a few general-rule type resolutions, though more specific plans don’t work well for me. Last year I was quite good about buying fabric only after I had prepared and fitted the pattern. This year I want to use mainly stash – means some fabrics will not be ideal as most of my stash is quilting cottons. As I like scrappy quilts I love having a good fabric selection. But it really is time I reduced from 10 boxes of it ! So for warmth I may be making quilted clothes. I’m also cutting down on buying patterns, though I am a pattern geek and it’s a modest luxury. Confess I’m now rarely willing to pay the huge postal charges for independent patterns from the US. This year I may only buy patterns with special features. I want to add style features to my own patterns, to reduce all the fitting work which I don’t enjoy. Have noticed that while I’m quite tolerant of the failings of RTW, I expect perfection from my own work. Ah well. . . One of my big gifts is making things more complicated for myself. . . I have difficulty with starting (and finishing!) at an easy ‘good enough’ level. I always have a head bursting with ideas for alternatives and improvements. So, rather often I don’t finish projects that are old ideas. I need to think of them as ‘development studies’. I also need to build confidence by repeating. Always rushing on to the next thing is not a good way of developing secure skills ! Hmmm – perhaps my big ‘rule’ should be to make two of everything – but that’s exactly the sort of specific rule which tends to bring my sewing to a halt. . .
It’s interesting to try to pick only one pattern for each of my wardrobe needs (shirt, tunic, vest, jacket, pants). Have most difficulty with choosing only one tunic – a good cue that’s my ‘signature’ garment. What are your opposite resolutions ? Resolutions are often like Lent	– we resolve to do things we don’t enjoy. “Be more disciplined”. “Improve”. Come on guys – this is a hobby ! If you love being disciplined, or learning, you’re probably doing it already. If you don’t love being disciplined or learning, they’re not things to waste your leisure time on. If the thought of higher quality sewing gives you pleasure, of course learn how to. But if you don’t want to learn more – will millions die ? A little more discipline or practice may be necessary to get things finished – but does it really matter if you don’t ? What is your personal best balance between freedom and control, moving on or continuing as before ? – buy hundreds of yards of fabric and hundreds of patterns. – choose one single commercial pattern and make it throughout the year without any alterations. – never make something that needs an unfamiliar technique. – never worry about quality of fit or sewing. – plan my whole wardrobe in detail before sewing anything and never change my mind. – or – never check with my existing closet before choosing what to make next. Part of getting a easy co-ordinated wardrobe is to have everything in similar shapes (see my post on reducing the number of shapes). And an easy way of achieving that is to use a wardrobe pattern. The advantage of wardrobe pattern books is they have space to discuss building a wardrobe of co-ordinates. Plus instructions for altering the patterns to make different styles. So they’re good starting points if you want to try this. Get the basic patterns to fit, and then any variations you make are likely to fit well too. Some books emphasise wardrobe building, some pattern altering. A few have advice on fit. Some have guidance for sewing beginners. Unless otherwise mentioned, all have a pack of full sized conventional tissue paper patterns. Most go up to 44 or 46 inch/ 117 cm bust, BMV sizes 24 – 26. There are now many books which include full-size patterns. I started by thinking I knew them all, but now know I don’t ! This is a rapidly expanding area of sewing publishing. I’m focussing on books with patterns for a wide range of garment types. I have collected rather a lot of these 😀 so this topic spread and spread and I’ve divided it in sections. My next post is planned on books which emphasise dresses. Then there’s a third post on out-of-print and Japanese books. There are two starting points used for pattern making (see dartless block post). One is a fitted block. The other is a looser fitting block without darts. This post is about pattern books with casual styles. The first are based on the casual dartless block, the others are more fitted. Does the ‘Core 4’ idea meet all your wardrobe needs ? – top, jacket, skirt, pants. Wardrobe patterns may be the best starting point for that type of wardrobe. There’s only one book based on a Core 4, and it’s for a petite plus body type. And it has a woven blouse top, not a knit. There are many wardrobe patterns with knit tops. Several pattern books don’t include a jacket. So they’re not sufficient for people who need to layer, unless you’re happy with shirt-jacket style. Some pattern books don’t mention dresses, so aren’t for people who like to wear them. Books with dresses are mainly in my second post. If you wear multiple layers (top, shirt, vest, jacket), there’s one out-of-print pattern book by Sandra Betzina with all these. If you’d like a wide range of garment types in one book and enjoy a challenge, there are Japanese pattern books in many styles. Those are in my third planned post in this group. A book on simple pattern making using personal measurements, by Cal Patch. 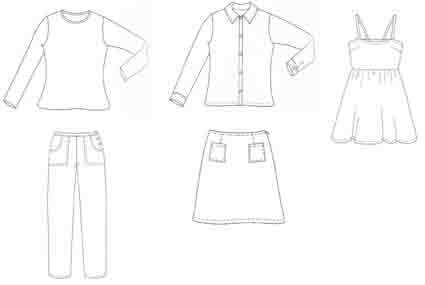 Basic patterns for knit tee, dartless shirt, skirt, pants, dress. The special feature of this book is you draft your patterns to your own measurements ! Mainly words with few pictures. Minimal sewing instructions. No discussion of wardrobe co-ordination. Basic patterns are classic casuals, many suggestions for adapting the basic patterns to make modern styles. More dresses from the shirt and tee patterns. Sew What Fleece by Carol Jessop and Chaila Sekora. Good if you want easy warm jackets, vests, coats, robes to add to a wardrobe book which doesn’t include them. I like these books. They make a good starting point for beginners. No very poor reviews at Amazon. A different take is Make your own clothes by Marie Clayton. This includes software for making personal patterns. Sorry, I don’t think much of either the software or the sewing instructions for beginners. Here’s my review at Pattern Review. P.S. Rosie Martin of DIY Couture has a new book of simple make-it-yourself patterns which don’t involve complex drafting, plus illustrated sewing instructions for beginners. Haven’t seen it yet but it looks fun. 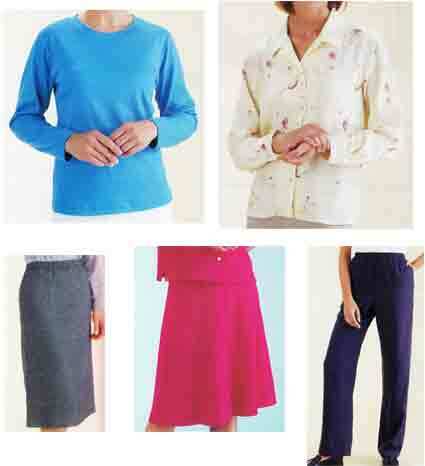 Simple basic patterns for knit tee, dartless blouse, 2 skirts, pants (elastic waists). Kwik Sew type patterns on thick white paper. Up to 45 inch/ 114 cm bust, 47 inch/ 120 cm hip. 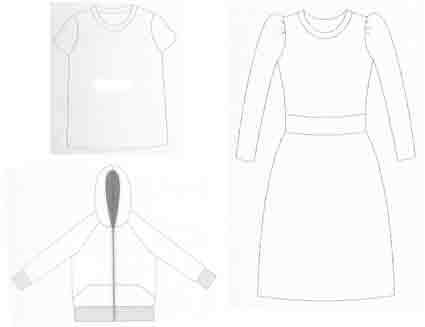 Many simple instructions for changing the patterns to make other styles, from zip front hoodie to nightwear. The dresses shown are all two-piece, but you could extend these patterns to simple shirt and shift one-piece dresses. Good for beginners, with Kwik Sew’s simple clear sewing instructions. No discussion of wardrobe building. Fit advice only about changing length. Universally good reviews. Many modern casual styles are more fitted and do have darts. Wendy Mullin’s books are bursting with excellent pattern altering ideas, but the patterns and sewing instructions sometimes need care. She has her own RTW clothing line and used to design patterns for Simplicity. There are 4 pattern books, which build into a comprehensive wardrobe (though there’s no discussion of that). All books have 3 basic patterns. 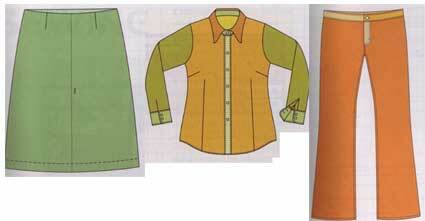 The first, Sew U, has patterns for skirt, shirt, pants. (I’m disappointed there’s no pattern for the bag on the cover :D) Up to 38 inch/ 98 cm bust, 42 inch/ 107 cm hip, BMV size 18. Many suggestions for changing the style elements on these patterns. Advice for sewing beginners, though these styles are perhaps a bit much for timid learners. Fit only mentioned in passing. Rightly well known. – dress with waistline seam. 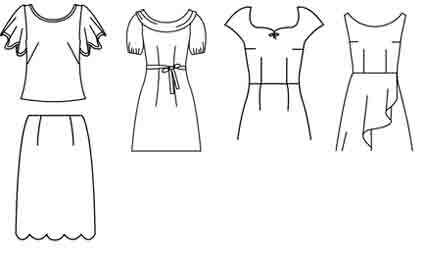 Pattern alteration and sewing instructions for 6 versions of each style – changes in neckline, length, shape. . .
Good knit sewing instructions for beginners, but no advanced techniques such as stabilising or using a double needle. Some people like close fitting knits. Some like their knits loose and baggy. Reviewers say these patterns make up large. So check for your preferred level of ease. And some think the result doesn’t look like the picture. So do make a trial version. Wendy Mullin also has a book on Dresses. I’ve put that in my post on books for dresses. – armhole princess fitted jacket. – dartless casual jacket described as ‘not-too-snug’ and used for loose styles like a parka. – raglan sleeve dartless outerwear coat. A good range of basic shapes for outerwear. Most styles have neckline and front opening interfacing, but no more complex support structures. Many have linings. Sadly these jacket and coat patterns are tiny, only 1 – 2 inches/ 2 – 5 cm ease. Barely movement room, certainly not large enough for layering. Here’s my comments at Pattern Review. 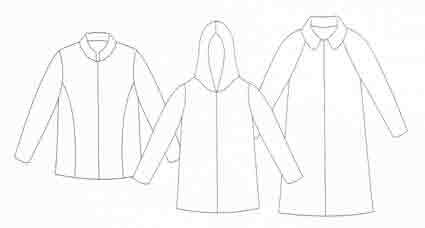 The pattern altering instructions for jackets and coats are good and inspirational, with multiple variations. But the sewing instructions are not always clear and the patterns are unusable. These are exciting styles – what a disappointment ! You need properly sized patterns and a technique book if you want to try these jacket or coat styles. by Kathleen Cheetham of Petite Plus patterns. 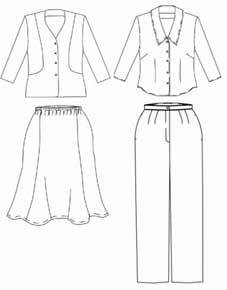 Patterns for blouse, jacket, skirt, pants. This is the only wardrobe pattern book I know of which covers a ‘Core 4’. Sized for petites 40 to 50 inch/ 117 cm bust, 42 – 52 inch/ 132 cm hip, BMV sizes 18 to 28. Lengthen lines on the patterns, so you can alter them for height. Much good discussion on using the patterns to build a wardrobe. Only simple pattern changes, such as different sleeve lengths, a small choice of collar shapes, some trim changes. 14 pages on fit, covering all the main issues. Good sewing instructions with many photos and diagrams. Sew Everything Workshop by Diana Rupp. For sewing beginners not wardrobe planning. Over 100 5-star reviews at Amazon, but look at the 3 star reviews to get some heart felt comments. I have seen this but ‘handed it on’ as the projects aren’t my style and I didn’t need the guidance. That was some time ago so I can’t now comment in detail. With patterns for several garment types. It’s Stitchers’ Guild ‘Sewing With A Plan‘ time again, so many people are thinking about wardrobe co-ordination. Would any of these wardrobe pattern books give you a simple starting point for your own co-ordinates ?